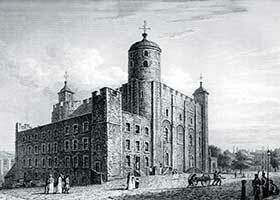 The History of the Tower of London is great, bloody and cruel and the Martin Tower has its part to play in its story. Martin Tower is just one of the 21 towers which, together, form the Tower of London castle complex. The Tower of London covers an area of 18 acres and its magnificent architecture covers almost all the styles which have flourished in England. Although the Tower is no longer a place of great military strength it has in time past been a fortress, a palace, and a prison. This section provides key facts and information about the Martin Tower. The purpose of the Martin Tower changed according to the requirements of the era. In general terms the towers were built for accommodation, including prisons, and as gateways protecting the Tower of London concentric castle complex. The concentric castle design ensured protection of the Tower of London with successive lines of fortification - many of the different towers were gradually added, over many hundreds of years, providing additional protection. Specific facts and info about which English King was responsible for building the towers, when the towers were built, the style of architecture and interesting info about its history. Who built the Martin Tower in the great Tower of London in England? History - The story of the Wizard Earl. Henry Percy the ninth Earl of Northumberland was imprisoned in the Martin Tower in 1605, for seventeen years, implicated in the Gunpowder Plot. He was a scholar, cartographer, astronomer and alchemist. He was also a central figure in what became known later as "The School of Night"
The Martin Tower saw the callous and audacious attempt by Colonel Thomas Blood (1618 - 1680) and his three accomplices to steal the Crown Jewels. The Deputy Keeper of the Jewels, was a 77 year old man named Talbot Edwards who lived with his family in the tower. Thomas Blood had gained the confidence of the old man by pretending to be a Parson. On May 9th 1671 Blood and his accomplices were shown by Talbot Edwards to the chamber where the Crown Jewels were kept. A cloak was thrown over his head, he struggled was hit over the head and finally stabbed to death. The gang stole St. Edward's Crown and the Sceptre but were disturbed and fled. They were all captured. Blood refused to answer any questions and insisted he would talk to no one but the king. Two days later he was granted an audience with King Charles II. Colonel Thomas Blood was inexplicably released and given a Royal pardon and pension! The reason for this remains a total mystery however speculation would have that King Charles II ( who was extremely short of money ) was himself behind the plot to steal the Crown Jewels! The very walls of the Martin Tower contain some of the mysteries and bloody secrets and the of the history of the Tower of London. Which King was responsible for building the Martin Tower and what was his reason? When was it built? Interesting facts and info about the history of the Tower of London!